Ig-like transcripts (ILTs) encode cell surface receptors expressed on myeloid and lymphoid cells that are structurally and functionally related to killer cell inhibitory receptors. One ILT, designated ILT1, contains a short cytoplasmic domain that lacks sequence motifs implicated in signal transduction. Its function is unknown. Similar short cytoplasmic domains have been observed in activating NK cell receptors and FcαR, which transduce stimulatory signals via associated DAP12 and FcεRIγ proteins, respectively. Here we show that ILT1 receptor is selectively expressed on myeloid cells, functions as an activating receptor, and associates with FcεRIγ rather than DAP12. Immunoglobulin-like transcripts (ILTs)3 encode Ig superfamily receptors structurally and functionally related to killer cell inhibitory receptors. ILTs are expressed on lymphoid and/or on myeloid cells, and some of them are specific for MHC class I molecules (see Ref. 1 for review).4 ILTs can be classified by differing transmembrane and cytoplasmic domains (2). One subset of ILT receptors displays long cytoplasmic domains containing immunoreceptor tyrosine-based inhibitory motifs (ITIMs). These receptors mediate inhibition of cell activation by recruiting protein tyrosine phosphatase SHP-1 (3, 4, 5, 6, 7, 8). Another subset of ILT receptors is characterized by a short cytoplasmic domain that lacks sequence motifs implicated in signal transduction as well as a single basic arginine residue within the hydrophobic transmembrane domain (2, 7). Transmembrane domains with a basic residue (lysine or arginine) followed by short cytoplasmic domains are shared by activating NK cell receptors for MHC class I molecules (9) and FcαR (10). To transduce signals, activating NK cell receptors and FcαR associate with distinct tyrosine-based activating motif-containing proteins, called DAP12 (11, 12, 13) and FcεRIγ (14, 15) respectively. Because of these structural similarities, it seems most likely that ILT receptors with short cytoplasmic tails activate cells and use an associated protein to transduce stimulatory signals. To verify this hypothesis, we have generated a specific mAb for one of these receptors, designated ILT1 (2), and have examined its biological function, signaling properties, and biochemical composition. Monocytes were prepared from PBMCs by percoll gradient density centrifugation. Dendritic cells (DC) were cultured from purified monocytes in RPMI 1640 and 10% FCS supplemented with granulocyte-macrophage CSF and IL-4 as previously described (3). Macrophages were obtained by culturing monocytes for 10 days in RPMI 1640 and 20% human serum supplemented with 1 ng/ml macrophage CSF. ILT1, FcεRIγ, and DAP12 cDNAs were subcloned into pCMV-FLAG-1 (Kodak, Rochester, NY) and expressed as amino-terminal FLAG peptide fusion proteins in rat basophilic leukemia (RBL) cells (ILT1/FLAG), in mouse mastocytoma P815 cells (ILT1/FLAG) and 293 cells (FcεRIγ/FLAG, DAP12/FLAG). Full-length ILT1 cDNA was subcloned into pcDNA3 (Invitrogen, San Diego, CA) and expressed into 293 cells. Transient and stable transfections were performed as previously described (8). Cell surface expression of transfected cDNAs was determined by FACS analysis. Wistar rats were immunized with ILT1/FLAG-transfected RBL cells. Anti-ILT1 mAb 135 (rat IgG2a) was selected by flow cytometry for staining ILT1/FLAG-transfected RBL cells, as compared with ILT2, ILT3, ILT4, ILT5 (3, 5, 8) and LIR6a (7) transfectants or untransfected cells (data not shown). ILT1/FLAG-transfected and untransfected RBL cells were pulsed with [3H]hydroxytryptamine (NEN, Boston, MA) as described (5), and incubated for 30 min on ice with either one of the following Abs: mouse anti-2,4-dinitrophenyl (DNP) IgE (Sigma, St. Louis, MO), anti-FLAG M2 mAb, or control mouse IgG (Southern Biotechnology Associates, Birmingham, AL). Cells were then incubated in RPMI 1640 and 5% FCS for 1 h at 37°C. Cross-linking Ab (goat F(ab′)2 anti-mouse IgG (Southern Biotechnology Associates), 10 μg/ml) was also added to cells previously incubated with anti-FLAG M2 mAb and control mouse IgG. 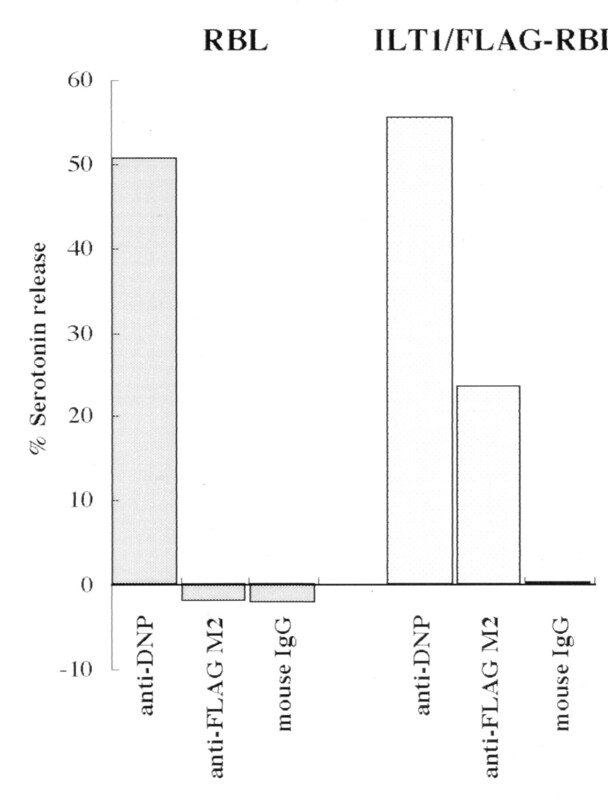 Serotonin release was measured as described (5). Cells were loaded with Indo-1 AM dye (Sigma, St. Louis, MO) and analyzed on a flow cytofluorometer as described (5). After a baseline was acquired for at least 30 s, 100 μl of culture supernatants of either anti-ILT1 mAb 135 or an isotype-matched control mAb (PB493, rat IgG2a, anti-mouse pre-B cells, kindly provided by Antonius Rolink, Basel, Switzerland) and 10 μg of a cross-linking Ab (goat F(ab′)2 anti-rat IgG Fc (The Jackson Laboratory, Bar Harbor, ME)) were added to the cells, and analysis was allowed to continue up to 512 s.
ILT1 receptor was immunoprecipitated from 125I-surface labeled human monocytes with mAb 135 and from 125I-surface labeled ILT1/FLAG-transfected P815 cells with anti-FLAG M2 mAb (16). Immunoprecipitates were analyzed by standard SDS-PAGE. In immunoblotting experiments, ILT1 receptor was immunoprecipitated from monocytes and 293 transfectants with mAb 135 and from ILT1/FLAG-transfected P815 with anti-FLAG M2 mAb. FcεRIγ/FLAG and DAP12/FLAG were also immunoprecipitated with anti-FLAG M2 mAb. Cells were lysed in 1% digitonin buffer (16). Immunoprecipitates were separated on one-dimensional or two-dimensional (nonreducing vs reducing) SDS-PAGE, transferred to nitrocellulose membranes, and immunoblotted with anti-FcεRIγ (kindly provided by Francois Letourneur, Lyon, France) or with anti-DAP12 (kindly provided by Kerry S. Campbell, Philadelphia, PA) rabbit antisera as previously described (16). In whole blood leukocytes, anti-ILT1 mAb 135 stained all monocytes (Fig. 1⇓, A and B), and, to a lesser extent, all granulocytes (Fig. 1⇓, A and B). ILT1 receptor was also expressed on DC and macrophages derived from purified monocytes under appropriate culture conditions (Fig. 1⇓, C and D). Only a very small percentage of peripheral NK cells (<1% of total lymphocytes) expressed ILT1 receptor in the blood donors tested (n = 20) (data not shown). However, it cannot be excluded that, in some donors, NK cells expressing ILT1 receptor may represent a higher percentage of total lymphocytes. From monocytes, the mAb 135 immunoprecipitated a prominent protein of ∼69 kDa under reducing conditions, and of ∼49 kDa after N-deglycosylation of the immunoprecipitates (Fig. 2⇓). A protein with identical electrophoretic mobility was immunoprecipitated from 125I-surface labeled ILT1/FLAG-transfected P815 cells with the anti-FLAG peptide M2 mAb, thus confirming the specificity of mAb 135 for ILT1 (Fig. 2⇓). ILT1 receptor is preferentially expressed on myeloid lineage cells. 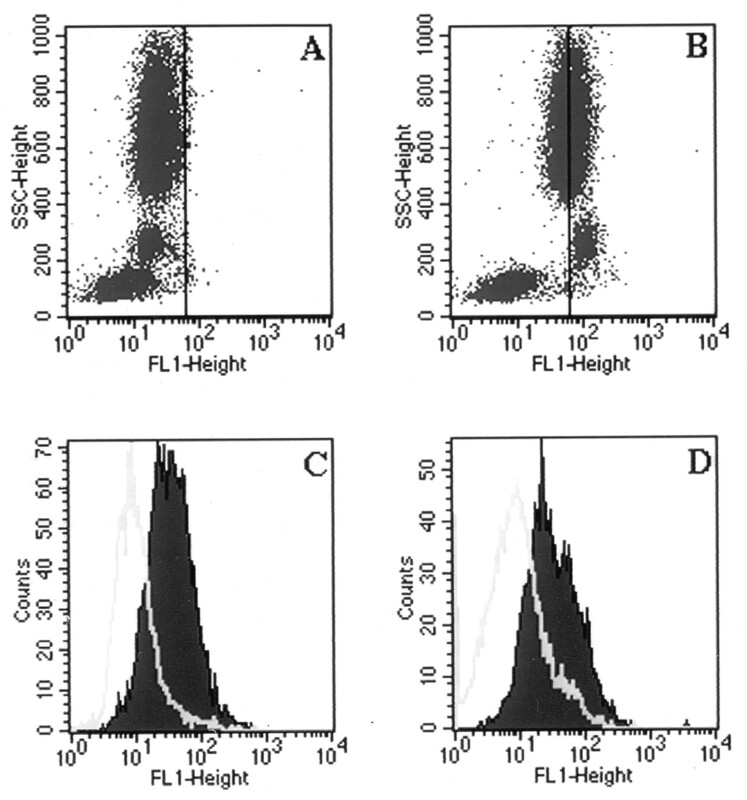 Whole leukocytes were stained with control mAb PB493 (rat IgG2a) (A) or anti-ILT1 135 mAb (B), followed by FITC-conjugated goat anti-rat IgG, and analyzed by flow cytometry. SSC high, intermediate, and low populations correspond to granulocytes, monocytes, and lymphocytes respectively. Anti-ILT1 mAb 135 stains DC (C) and macrophages (D) cultured from monocytes (shaded profiles). Thin profiles illustrate staining with isotypic control PB493. ILT1 receptor is an ∼69-kDa glycoprotein. Left panel, Peripheral monocytes (2 × 108) were surface labeled with 125I and precipitated with anti-ILT1 mAb 135. Precipitates were treated with or without N-glycosidase F for 18 h and analyzed by standard SDS-PAGE under reducing conditions. After deglycosylation, the molecular mass of ILT1 receptor is reduced from ∼69 kDa to ∼49 kDa, which corresponds to the predicted molecular mass of ILT1 receptor. Right panel, Proteins with the same electrophoretic mobility were immunoprecipitated from ILT1/FLAG-transfected P815 cells using anti-FLAG M2 mAb. ILT1 receptor triggers serotonin release in ILT1/FLAG-transfected RBL cells. ILT1/FLAG-transfected and untransfected RBL cells were incubated with anti-2,4-dinitrophenyl (DNP) IgE, anti-FLAG M2 mAb, or control mouse IgG on ice for 30 min. Cells were washed, resuspended in 5% FCS and RPMI 1640, and incubated 1 h. Goat F(ab′)2 anti-mouse IgG was also added to cells incubated with M2 mAb and mouse IgG as a cross-linker at the final concentration of 10 μg/ml. Serotonin release is expressed as a percentage of maximum release. To further explore the stimulatory function of ILT1 receptor, we tested whether ILT1 receptor can trigger Ca2+ mobilization in monocytes and in ILT1/FLAG-transfected cells. As shown in Fig. 4⇓, cross-linking of ILT1 using mAb 135 induced significant intracellular calcium mobilization in monocytes (Fig. 4⇓A), in ILT1/FLAG-transfected P815 cells (Fig. 4⇓C), and ILT1/FLAG-transfected RBL cells (data not shown), whereas no changes were detected with control Abs (Fig. 4⇓, B and D). Moreover, mAb 135 did not trigger calcium mobilization in untransfected P815 cells (data not shown). These results demonstrate that ILT1 receptor mediates positive signaling in myeloid cells and that mouse P815 cells, like rat RBL cells, express the signal transduction components necessary for ILT1 receptor to maintain its signaling capacity. ILT1 receptor induces intracellular Ca2+ mobilization. Cross-linking of ILT1 receptor by mAb 135 triggers significant Ca2+ mobilization in monocytes (A) and in ILT1/FLAG-transfected P815 cells (C) as compared with monocytes and ILT1/FLAG-transfected P815 cells incubated with isotypic control mAb PB493 (B and D). Cytoplasmic calcium levels were monitored in individual cells by measuring 405/525 spectral emission ratio of loaded Indo-1 dye by flow cytometry. After establishing a baseline, analysis was paused for mAb and/or cross-linker addition, as indicated by the gaps in the dot plots. To determine whether ILT1 receptor associates with either FcεRIγ or DAP12, which serve as signaling partners for FcαR and activating NK cell receptors, we first measured ILT1 cell surface expression after transfection of 293 cells with ILT1 cDNA alone (Fig. 5⇓A) or in combination with cDNAs encoding either FcεRIγ or DAP12 as amino-terminal FLAG peptide fusion proteins (Fig. 5⇓, B and C). As shown in Fig. 5⇓B, 293 transfectants expressed ILT1 receptor at significant levels only in the presence of FcεRIγ/FLAG, suggesting that FcεRIγ associates with ILT1 receptor and is critical for ILT1 cell surface expression. To directly demonstrate this interaction, ILT1 receptor was immunoprecipitated from monocytes, analyzed by two-dimensional SDS-PAGE (nonreducing/reducing), and immunoblotted to test for FcεRIγ association. This analysis confirmed that ILT1 is associated with a 10-kDa molecule reactive with anti-FcεRIγ antiserum. FcεRIγ was associated with ILT1 as a disulfide-linked homodimer, as demonstrated by migration below the diagonal (Fig. 5⇓D). Murine FcεRIγ was also associated with ILT1/FLAG immunoprecipitated from ILT1-transfected P815 cells using the anti-FLAG M2 mAb (Fig. 5⇓E). In control experiments, FcεRIγ was not immunoprecipitated either from monocytes using an isotype-matched control Ab (Fig. 5⇓F) or from untransfected P815 cells using the anti-FLAG M2 mAb (Fig. 5⇓G). Both of these results strongly suggest that the association of ILT1 receptor with FcεRIγ is not due to nonspecific coprecipitation of Fc receptors for IgG. Lack of association with DAP12 was demonstrated by performing an anti-DAP12 immunoblot on ILT1 immunoprecipitates obtained either from monocytes (Fig. 5⇓H) or from 293 cells triply transfected with ILT1-, DAP12/FLAG-, and FcεRIγ/FLAG-encoding cDNAs (Fig. 5⇓J). A control anti-FcεRIγ immunoblot on these immunoprecipitates again detected FcεRIγ (Fig. 5⇓, L and N). Since 293 cells are Fc receptor-negative, this experiment confirmed that coprecipitation of FcεRIγ with ILT1 receptor is due to a specific interaction rather than to coprecipitation of Fc receptors for IgG. Upper panels, FcεRIγ facilitates cell surface expression of ILT1. 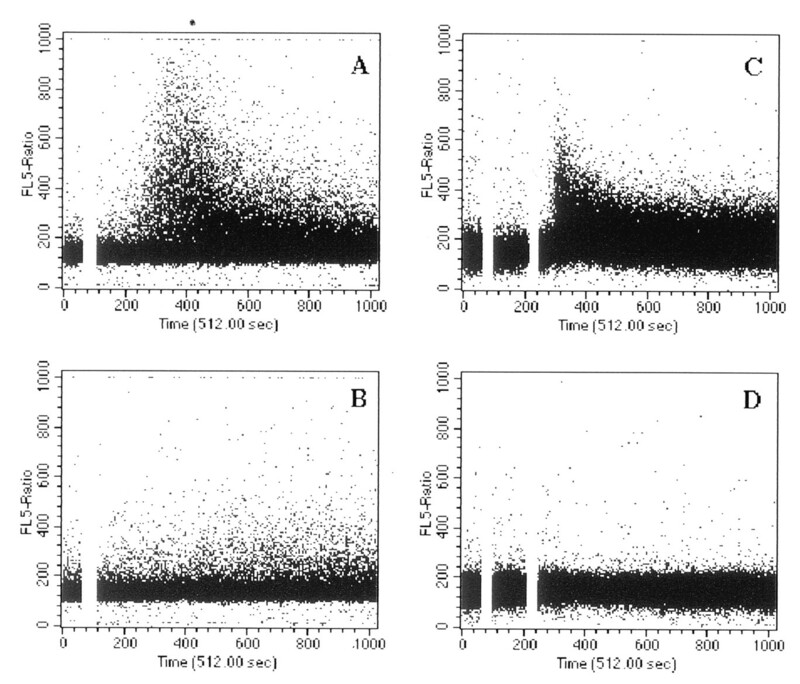 293 cells were transfected with ILT1 cDNA alone (A) or in combination with either FcεRIγ-FLAG (B) or DAP12-FLAG (C). Cell surface expression of ILT1 was determined by FACS analysis using mAb 135 followed by FITC-conjugated goat anti-rat IgG. Levels on negative controls (stained with PB493 followed by second step Ab) fell within the lower quadrants. Expression of FcεRIγ-FLAG and DAP-FLAG in 293-transfected cells was similar, as determined by FACS analysis with anti-FLAG M2 mAb (data not shown). Central panels, ILT1 receptor is associated with FcεRIγ chain. Peripheral monocytes (2 × 108) were lysed in 1% digitonin and immunoprecipitated with anti-ILT1 mAb 135 (D) or control rat IgG2a PB493 (F). Immunoprecipitates were separated by two-dimensional SDS-PAGE (nonreducing/reducing) and immunoblotted with rabbit anti-FcεRIγ antiserum. 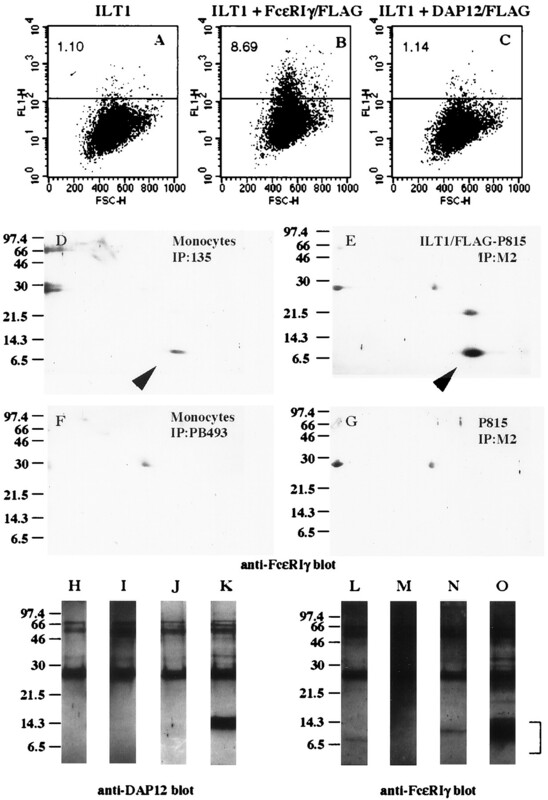 Immunoprecipitates from ILT1/FLAG-transfected (E) and untransfected P815 cells (G) with anti-FLAG M2 mAb were also immunoblotted with anti-FcεRIγ antiserum. The 10-kDa spots below the diagonal marked with an arrow in D and E represent FcεRIγ chain homodimers. Lower panels, ILT1 receptor does not associate with DAP12 in monocytes (H) and in Fc receptor negative 293 cells triply transfected with ILT1-, DAP12/FLAG-, and FcεRIγ/FLAG-encoding cDNAs (J). ILT1 receptor associates with FcεRIγ in monocytes (L) and in Fc receptor-negative 293-transfected cells (N). Monocytes were immunoprecipitated with anti-ILT1 mAb 135 (H and L) or control mAb PB493 (I and M). 293 triple transfectants were immunoprecipitated with anti-ILT1 mAb 135 (J and N) or with anti-FLAG M2 mAb (K and O) to control expression of DAP12/FLAG and FcεRIγ/FLAG cDNAs. Immunoprecipitates were immunoblotted with anti-DAP12 or with anti-FcεRIγ antisera as noted. Electrophoretic mobilities of FcεRIγ-FLAG (N and O) and FcεRIγ (L) are slightly different (bracket). Our results demonstrate that ILT1 receptor is an activating cell surface glycoprotein preferentially expressed on myeloid cells that triggers intracellular Ca2+ mobilization in monocytes and transfected cells, as well as release of serotonin in transfected RBL cells. The physiological functions regulated by ILT1 receptor in myeloid cells are yet to be defined. It may control oxidative burst, production of cytokines (such as IL1, TNF-α and IL12), or induce expression of costimulatory molecules. Engagement of ILT1 receptor with its ligand may be crucial to elicit significant physiological responses. 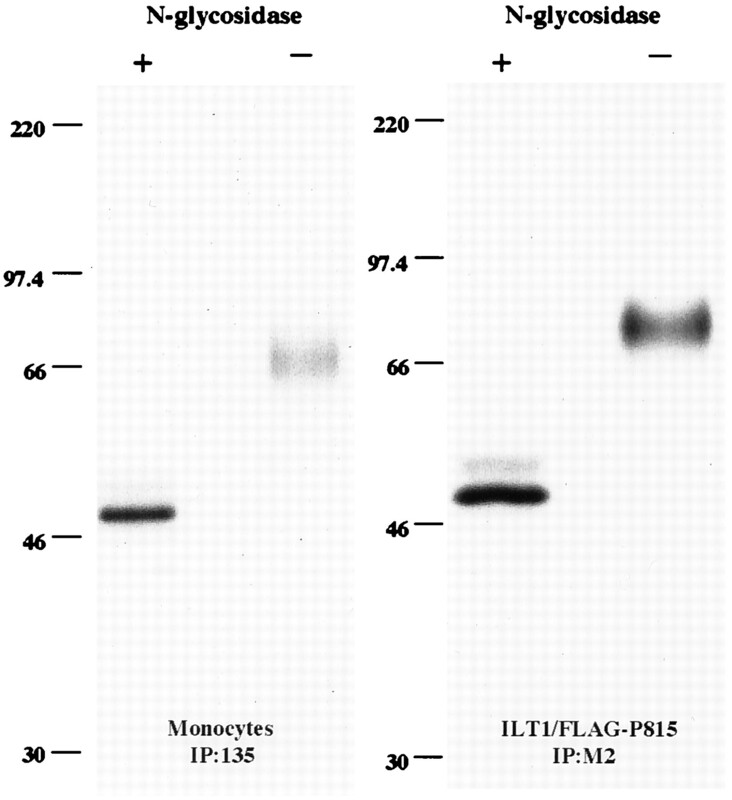 In preliminary studies, several soluble HLA class I tetramers did not bind to ILT1-transfected cells (data not shown). We are evaluating the possibility that ILT1 is a receptor for MHC class I-related molecules such as CD1, MR1, and MIC (17). Biochemical analysis has revealed that FcεRIγ is associated with ILT1 receptor and is required for efficient cell surface expression of ILT1. Functional analysis of FcεRIγ chains mutated in the ITAM motif is necessary to determine whether FcεRIγ is also transducing the signals that lead to ILT1-mediated cell activation. Most likely, FcεRIγ also associates with ILT1 receptor homologues such as LIR6 (7), ILT1-like protein (18), and ILT7 (GenBank accession number AF041261), and, possibly, the recently discovered murine counterparts of ILT1, referred to as paired Ig-like receptor A (PIR-A) or p91A (18, 19). In all of these molecules, the positively charged arginine residue within the transmembrane domain may be crucial for association with FcεRIγ. Indeed, site-directed mutagenesis of an arginine residue within the transmembrane domain of FcαR has previously been shown to disrupt functional association of FcαR and FcεRIγ (15). Interestingly, no association was detected between ILT1 receptor and the newly discovered signal transduction molecule DAP12, which is expressed in NK cells and myeloid cells. Thus, DAP12 may associate with yet another receptor on myeloid cells. We thank Annette Pickert, Stephan Meyer, and Mark Dessing (Basel Institute for Immunology) for expert technical advice in FACS and Ca2+ mobilization analyses; and Kerry S. Campbell (Fox Chase Cancer Center, Philadelphia, PA), Luca Bolliger, Marina Cella, Susan Gilfillan, and Raul Torres (Basel Institute for Immunology) for reviewing the manuscript. ↵1 The Basel Institute for Immunology was founded and is supported by Hoffmann-La Roche Ltd., Basel, Switzerland. ↵4 ILT receptors and closely related members of the same receptor family are also designated leukocyte Ig-like receptors (LIRs) and monocyte/macrophage inhibitory receptors (MIRs) (see Ref. 1 for review).